This is one of pianist-composer Thelonious Monk's greatest recordings and represents a high point in his career. 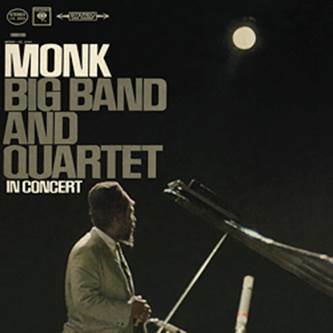 Performing at Philharmonic Hall in New York, Monk is heard taking an unaccompanied solo on "Darkness on the Delta" and jamming with his quartet (which had Charlie Rouse on tenor, bassist Butch Warren, and drummer Frank Dunlop) on fine versions of "Played Twice"
This set has its most memorable moments during the six full-length performances by a ten-piece group. Monk's quartet was joined by cornetist Thad Jones, trumpeter Nick Travis, Steve Lacy on soprano, altoist Phil Woods, baritonist Gene Allen, and trombonist Eddie Bert. Jones and Woods have plenty of solos and, although Lacy surprisingly does not have any individual spots, his soprano is a major part of some of the ensembles. Most remarkable is "Four in One," which after one of Monk's happiest (and very rhythmic) solos features the orchestra playing a Hal Overton transcription of a complex and rather exuberant Monk solo taken from his original record. Thelonious Monk could walk from his flat to New York’s famous Philharmonic Hall on the corner of 64th Street and Broadway when he made his very first appearance there with his Big Band in December 1963. And the other musicians could get there on the underground: Phil Woods, Steve Lacy, Thad Jones – all of them were members of Monk’s closest circle of collaborators. It is no wonder then that the well-known themes were highly agreeable and harmonious. "I Mean You", "Four In One" and "Epistrophy" resounded through the auditorium, the audience was thrilled, Thelonious laughed and danced and a short while later fans could listen to parts of the concert on a recording released by Columbia Records. In a break for a smoke, Monk sat himself down at the piano and played "Darkness On The Delta" – nocturnal atmosphere pure.